A roughly life-size version of a mini chainsaw. Wouldn’t this be a great inexpensive and light weight costume accessory? Or perhaps you might prepare to use it as a static prop in your home haunt or Halloween display. Place it by a fake severed head (or an old mask stuffed with wadded up paper towels), add some fake webs and dim lighting and you have a perfect spooky scene. 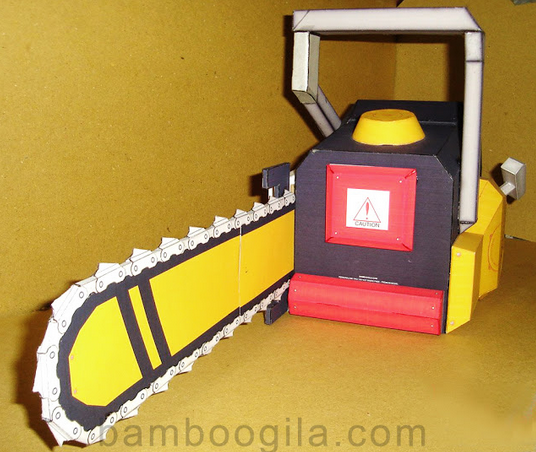 As the watermark in the above image says, this awesome papercraft model was created by Bamboogila. You can find the instructions here, but you have to jump through a few hoops before you can download the actual project template. I’m guessing this is due to his having issues with people trying to make money off his work in the past. Thankfully all you have to do is build three of his other papercraft models and take a picture of them (along with a piece of paper with your name on it) and send it to him. You have to build his Thor project, but you are free to pick the other two from his massive selection of paper models. Might I recommend his papercraft Jiangshi? Given the time it will take to put everything together, you had better act soon so you can have the chainsaw ready by Halloween! The image illustrating this article was licensed under a Creative Commons Attribution-NonCommercial-ShareAlike 3.0 Unported License. The rest of the article is copyrighted by Gravedigger’s Local 16.